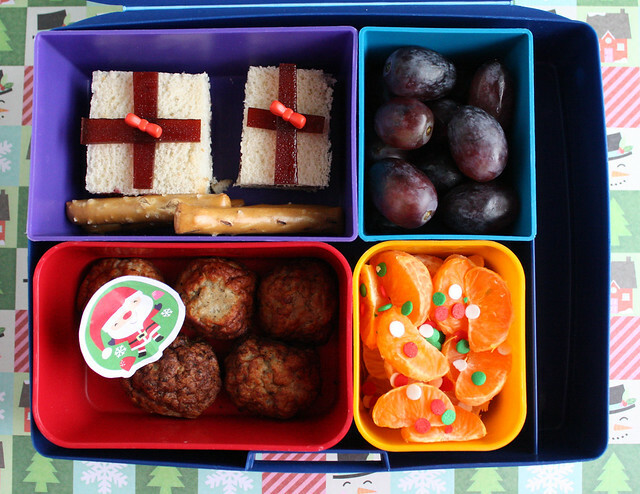 I kicked off the holiday bentos this week! Woo hoo! Normally I like to wait until December to start putting wintery lunches together, but I pulled a bunch of my Christmas supplies out while I was doing a little kitchen reorganization last weekend and they kids (especially Augie) immediately began pestering me to put them to use. So even though it’s still November, it’s time to get this (Christmas) party started! On Monday, I went with a gingerbread man theme for Augie’s lunch. 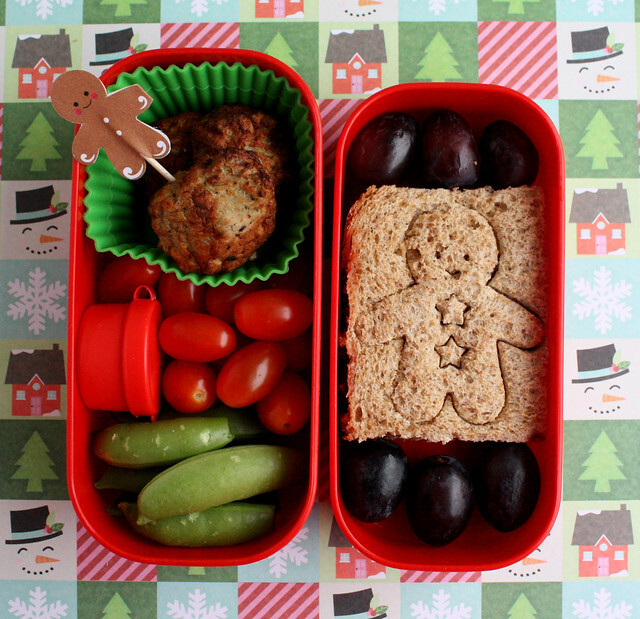 He had meatballs with a gingerbread man pick, tomatoes, hummus (in the red box), snap peas, grapes and a half a pb&j stamped with a gingerbread man shape. Wyatt had a jelly “present” sandwiches, pretzel sticks, grapes, mandarin oranges with sprinkles, and turkey meatballs with a paper Santa pick. To make the sandwiches, I cut a slice of bread into quarters and filled them with jam. Then I cut a piece of fruit leather into strips and cris-crossed it over the top of the bread. I secured the fruit leather and made the sandwiches look more gift-y by jabbing a red bow pick through the center of each sandwich. This was packed in one of our Laptop Lunches bento boxes. On Tuesday I packed Augie’s lunch in a newish, single layer box I picked up at Daiso a few weeks ago. The top part had a half pb&j with a reindeer pick in it and I filled the bottom with red and green silicone baking cups to be festive. I included strawberries (red! ), grapes (green! ), pretzel goldfish and dried cranberries (more red!). While I was making this, Augie asked me in the saddest voice ever why I “never give him treats, cause all the other kids get them in their lunches, but not me.” Ow! Knife through the heart! I decided I was being a mean nutrition police mom, so I told him I’d put a couple cookies in. His response: “Ew! Yuck! I hate cookies!” This was the first I was hearing about his cookie hatred, but I decided to roll with it so I asked him what a good treat would be. After a bit of thought, he told me he’d like something really delicious like “dried cranberries.” Ha! Ha! Where did this kid come from? 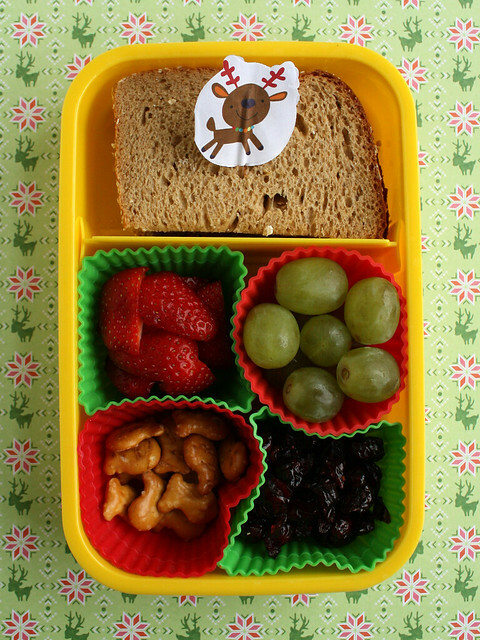 Augie was home sick from school with a bad cold, so no packed lunch for him. 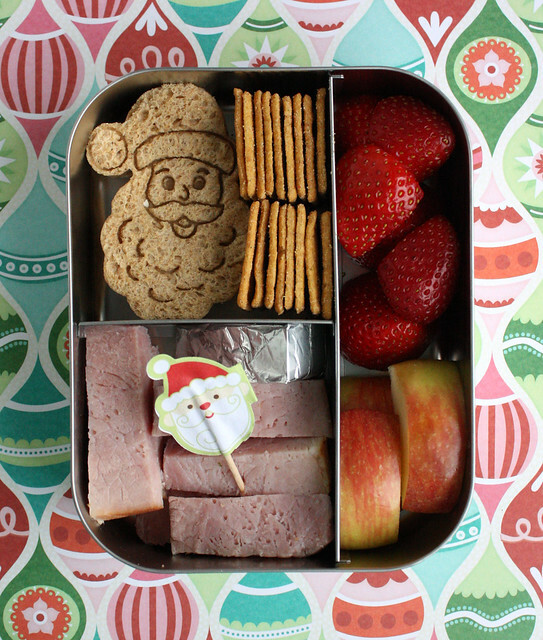 Wyatt got this cheerful Santa Claus lunch all packed up in our Lunchbots Trio: a Santa-wich filled with blackberry jam, ranch flavored Wheat Thins, a Laughing Cow cheese wedge, chunks of ham with a paper Santa pick to eat them with, strawberries and apples. The sandwich was made with a new stamping cutter from a set I found at Target. I can’t find a link on their site, but the brand is Nordicware and they were on an end cap in the kitchen section with some other holiday stuff. The rest of the cutters in the set were a gift, an elf, a reindeer and a sleigh. Very cute! Augie was home sick from school again on Thursday and we all overslept so we were rushed and Wyatt had to have school lunch again. 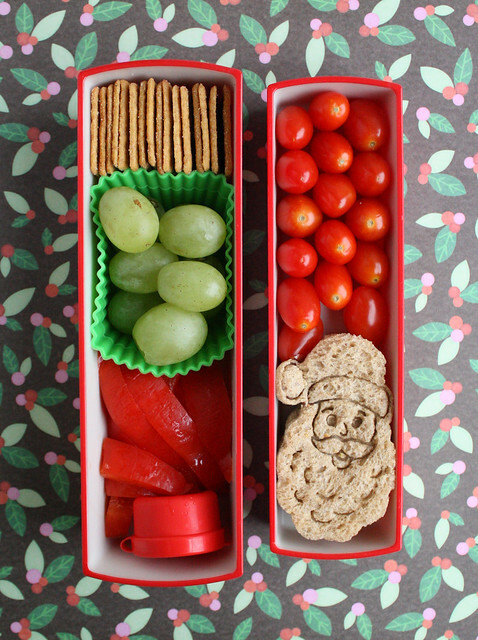 Augie was back in school again today so I packed him this lunch in our London bus bento box: ranch flavored Wheat Thins, green grapes, red pepper strips with hummus for dipping, grape tomatoes and a pb&j Santa sandwich. 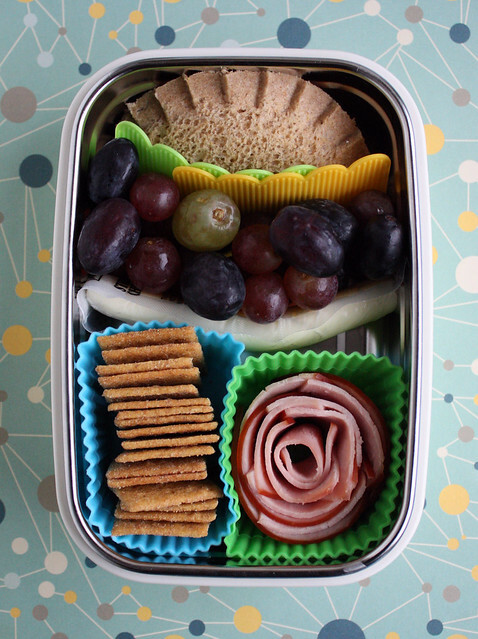 Wyatt had a jelly sandwich pocket (made with one of the smaller empanada makers in this set ), grapes, a cheese stick, ranch Wheat Thins and a ham rose.